This shop about how to doctor up a Frozen Pumpkin Pie has been compensated by #CollectiveBias, Inc. and its advertiser. All opinions are mine alone. If you ever host a dinner party, especially Thanksgiving dinner, by the time you get to making dessert you are exhausted. However, you would be mortified to just serve a frozen or store-bought pie. Well I think I have the solution, that I promise I won’t tell any one of how to make that frozen pie look homemade. I am the queen of semi-homemade recipes when it comes to desserts. 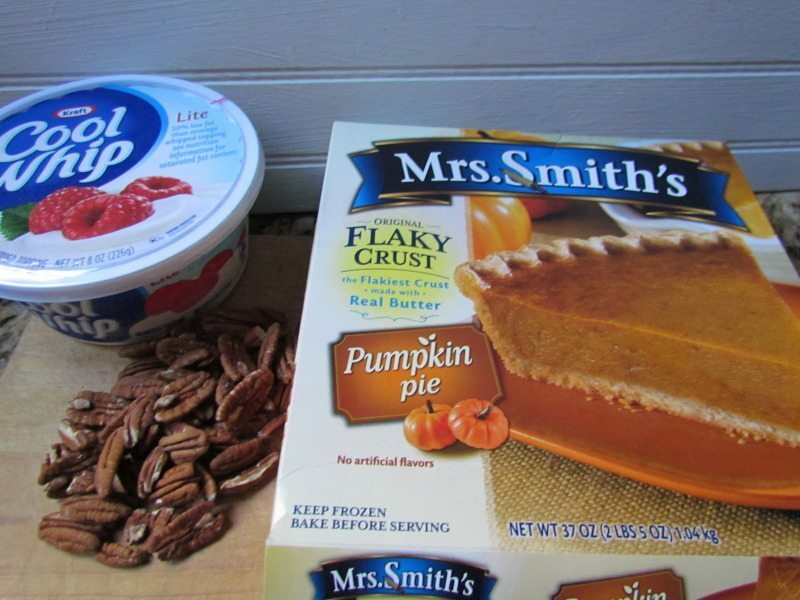 I needed a dessert this past weekend and decided to start experimenting for Thanksgiving dinner and saw the Mrs. Smith Frozen pies at Walmart. Just my luck they were located right next to Cool Whip which is another time saver at dessert time. 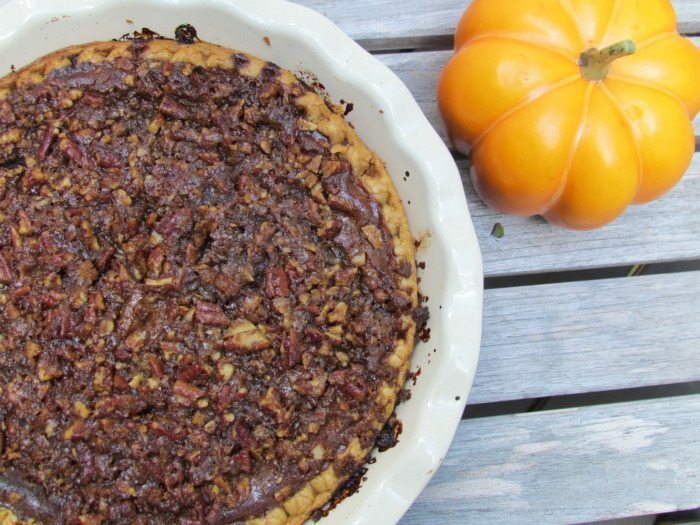 I grabbed a bag of pecans because pumpkin and pecan are some of my favorite pies. 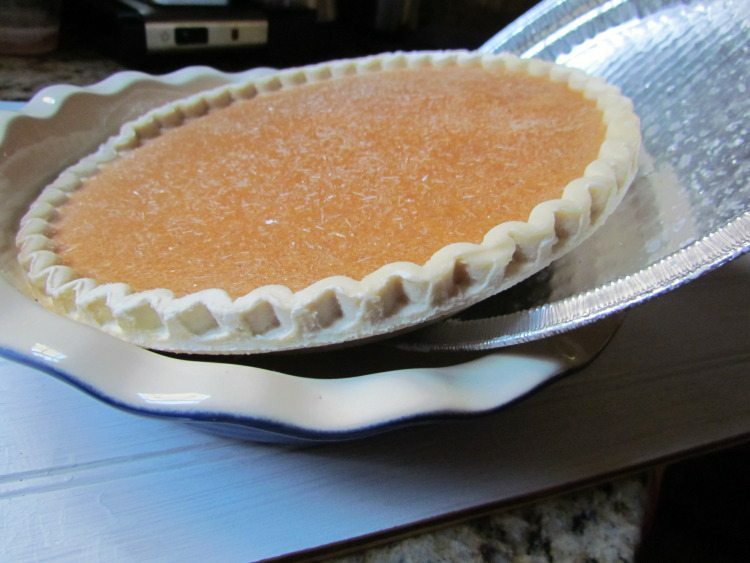 Secondly, changing the look of a frozen pumpkin pie dresses it up and looks more homemade. This is where I came up with the candied pecan pie with bourbon cool whip idea. Trust me this pie will look like you slaved in the kitchen for hours. Start off by baking the pie per the directions, but setting the timer 20 minutes less than the required baking time. 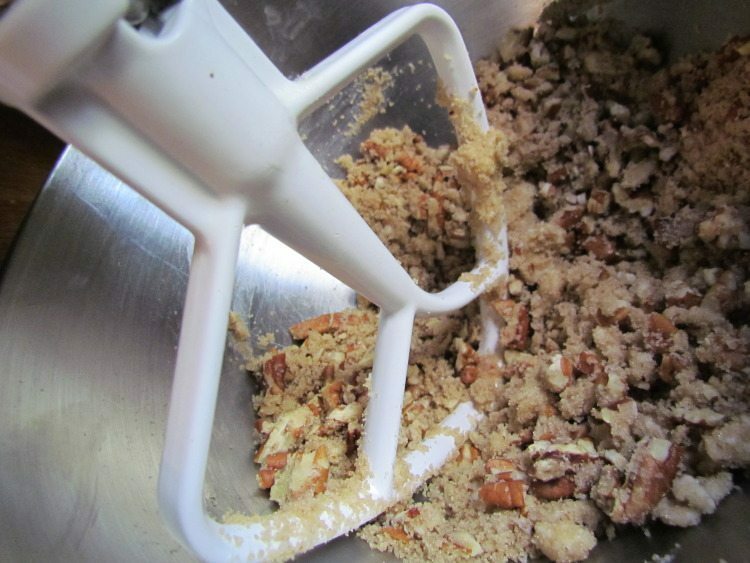 While the pie is baking you can make the candied pecans for the topping and for a garnish. First mix the topping ingredients together in an electric mixer until you get coarse crumbs. 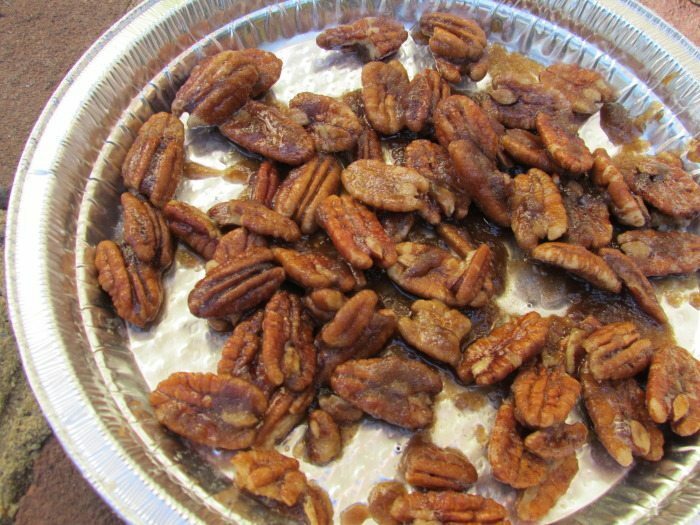 Using pecan halves make some candied pecans which make a great garnish and are delicious in salads too, so make extra. In a non-stick pan mix melt the 1/4 cup packed light brown sugar and 2 tablespoons butter. 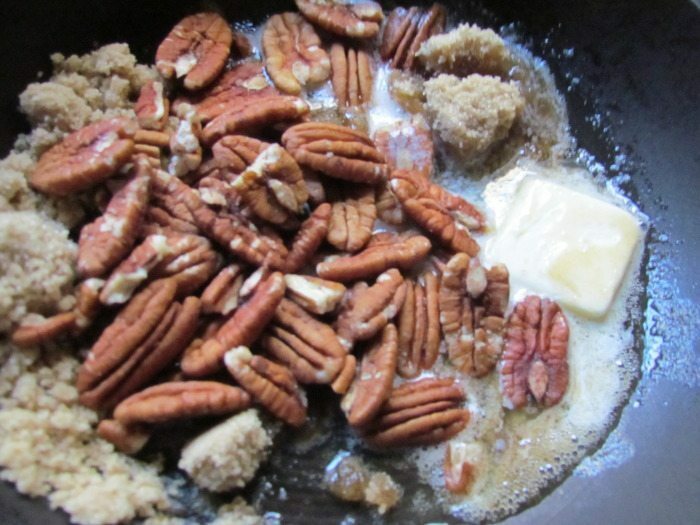 Add 1/4 to 1/2 cup pecan halves and stir to coat. Add a pinch of kosher salt. Spread them out on a pan and allow to cool. Breaking them up if necessary. When the timer for the pie goes off, (about 20 minutes less than cooking time ) cover the top of the pumpkin pie with the pecan crumble. Return to oven and cook for an additional 20 minutes or until the pie is cooked. IF the pecans are getting too dark cover them with tin foil. Allow the pie to cool for 2 hours before attempting to slice. 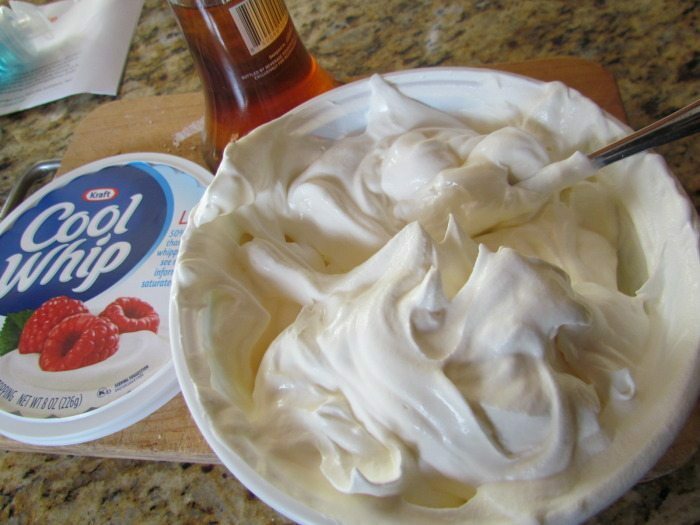 Mix 1 tablespoon of bourbon into your Cool Whip for extra flavor. If you prefer not to use alcohol I did see Vanilla flavored Cool Whip at Walmart. 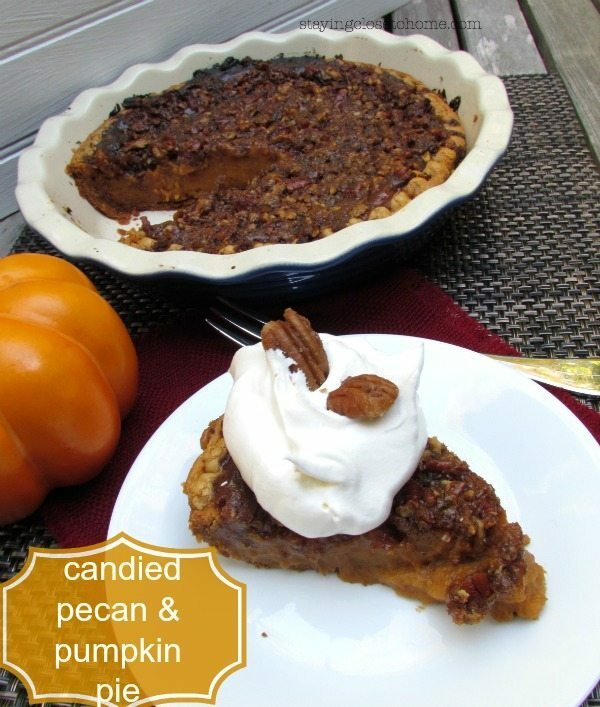 Serve each slice with a generous dollop of Cool Whip and a few candied pecan halves. Don’t like nuts but still want ideas on how to doctor up a Frozen Pie, check out the Cooking Up Good website. They have recipes, sweepstakes, loyalty programs, coupons and more! What’s not to love? 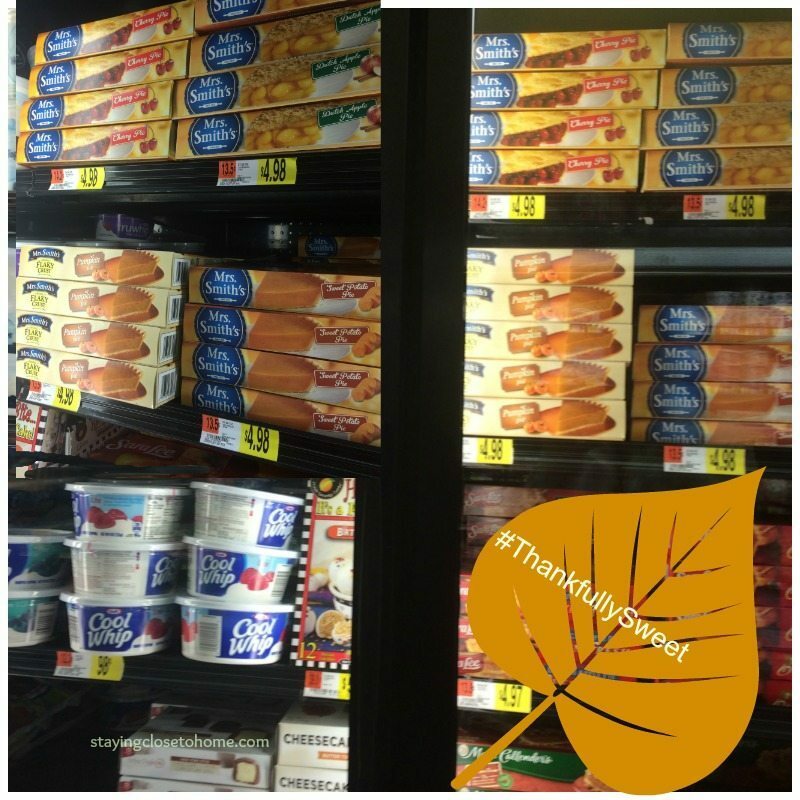 If you’re looking for a new dinner idea or a chance to win some awesome prizes, be sure to check it out and remember to be #ThankfullySweet! What are your semi-homemade tricks? what a great idea! this pie looks ten times better, would love to try it out. I saw this go by in my feed and had to come look at what you did! So yummy! This is genius. It looks so tasty and you would never know it’s frozen! That is a great idea. Someone always seems to give me a frozen pie and they end up going to waste. 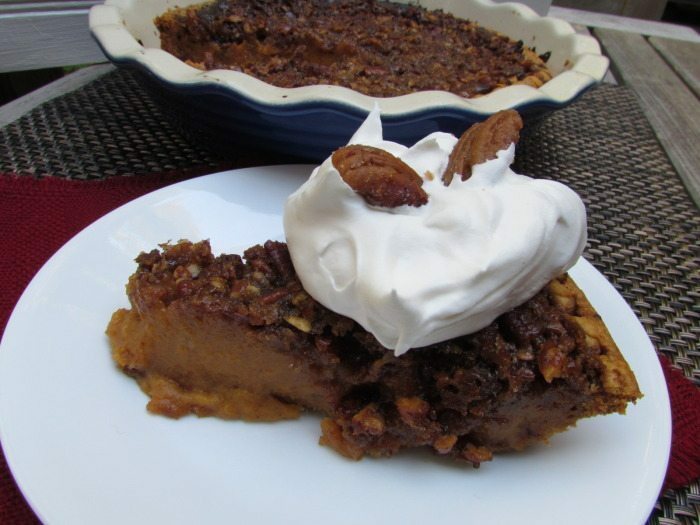 Great way to fancy up a frozen pumpkin pie. Looks really tasty!! Well can I just say YUM? That looks delicious! Thanks for sharing this great idea! As much as I don’t like pumpkin pie, I think the candied pecans are actually right up my alley. Will have to keep this recipe in mind for thanksgiving! Now these are tips I definitely need. There is no way I am making a homemade pie. I love Mrs. Smith’s Pies around this time of year. We always serve them on Thanksgiving and Christmas. 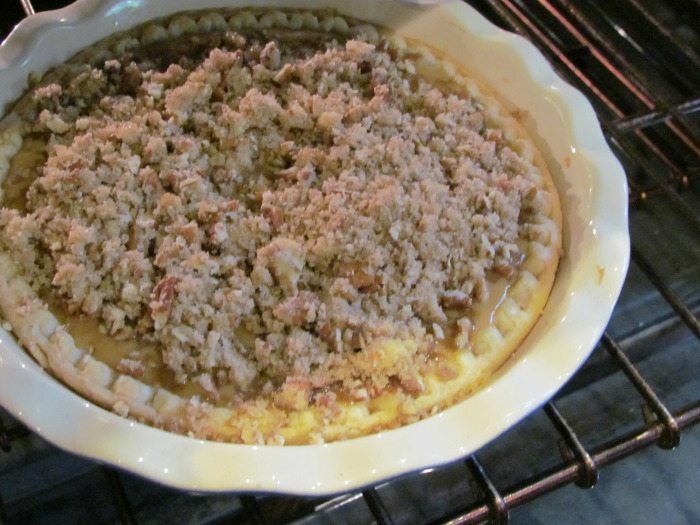 what a great idea to add pecans, it looks delicious! Awesome idea. This is something I will have to try. I love this idea. Mrs. Smiths Pies are amazing. Betsy, we buy stuffing as well and add to it, why not right?? thanks KatyRose I like our little secret too. Oh sweet Lord this looks delicious! I am going to have to remember this super recipe for Thanksgiving. Thanks!! I was contemplating making a pumpkin pie today too! Cool Whip goes perfectly on anything! Sounds like a nice way to doctor up pie! What a neat idea! I am going to try this! Love it when you can take a frozen pie and “tweak” it into something amazing! Now I have a hankering for pie…. LOL! I so love this recipe. I never would have thought to do this and to add bourbon to Cool Whip, my husband will love this. You can’t go wrong with whipped cream, right? I think it makes everything better. Mrs. Smiths Pies are always our go to pies. They make the dessert table Thanksgiving day desirable.